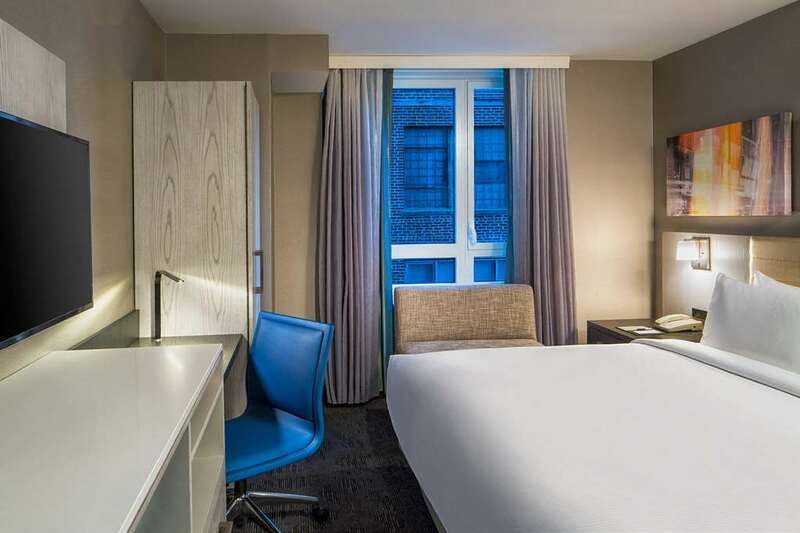 Welcome to the DoubleTree by Hilton Hotel New York - Times Square West just steps from the Broadway Theater District. Along with stunning views of the Empire State Building our New York Times Square hotel offers an enviable location near Rockefeller Center the Chrysler Building Madison Square Garden and other iconic attractions. The Port Authority Terminal is moments away and the Jacob Javits Center is a short walk perfect when visiting for a convention. Our friendly staff looks forward to welcoming you with a signature warm chocolate chip cookie at check-in. Settle into a guest room with a 40-inch HDTV premium cable a mini-fridge coffeemaker and well-equipped workspace. Complimentary WiFi keeps you connected and blackout curtains ensure a great night*s sleep. Upgrade for a higher floor prime city views satellite TV and a walk-in shower. For memorable Times Square dining visit our Magnolia Restaurant for delicious American favorites all day or unwind in the rooftop lounge with live music and unobstructed views over Manhattan. Relaxing in your room. Call on room service for a tasty meal delivered to your door. Keep up with work in the 24-hour business center and burn calories in the complimentary fitness center. We offer 1 000 sq. ft. of stylish New York City meeting space for your next small meeting or social event.